Grab a spare snare stand and use it to hold your new Laptop Drummer’s Tool-kit. Our selection of the best free Windows Apps for Drummers transforms the PC into an Instructor / Studio / Tool Kit / Music Stand / Band Mate and more! These are our recommended apps, but there are many more out there. A PC or Laptop with a suitable sequencer can be anything from a simple drum machine, a sandbox for grooves or a learning tool. It can also be a whole lot of fun just as a cool toy. here are our favourites. Up to 192 ticks per pattern with individual level per event and variable pattern length. Unlimited instrument tracks with volume, mute, solo, pan capabilities. Export song to wav, aiff, flac or ogg file. The orDrumbox is a free drum machine software, designed to be as creative as possible with unusual features : auto-composition, polyrythmes, unusual arpeggiator, automatic sounds/track matching , custom softsynths, lowfi rendering, etc. 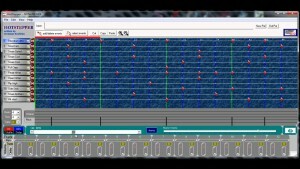 This tools can compose bass line and complete songs using included drum kits with the audio sequencer functions. You can create songs by assembling variouspatterns. It’s up to you to determine the number of beats in each pattern (16 or 32 or whatever). Each pattern is composed of tracks (as many as you want). Each track corresponds to one sound. The tracks/sounds can be pitched and mixed and panoramized, and solo/muted/ with the interface. Polyrhythms capabilities: Add a loop point at the step you want, independently on each track. The number of different sounds is not limited, neither the number of tracks in a pattern, nor the number of patterns in a song. On each track you can use an automatic fill enginepowered by artificial intelligence technology. This way you can add melodic scales and semi-random notes to make the orDrumbox compose rhythmic and melodic patterns under your control. Hotstepper is a free and easy to use drum sequencer with 12 channels. You can create music beats with different sound samples. You can use up to 12 different sounds simultaneously. After finishing your track you can export it to WAV file to the desired location. You can set the tempo of tracks by moving the BPM slider in the desired direction. It has various predefined samples with .HPA extension and they can help you when creating new ones. This beat maker program has wave stretching option which lets you stretch sounds to the length of the beat. It has delay control also and you can define the delay amount and adjust the value of feedback. The Musical Instruments Tuner helps your tune your instruments by analyzing their sounds. Usually, in order to fine tune your instruments to make the pitch of each music note precise, you adopt a timpani, and compare the tone of your instrument with the tone of the timpani. However, because of the inaccuracy of human acoustic perception or the lack of experience, it is hard to make each music note precise. 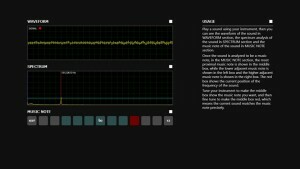 Given the fact that the pitch of a music note is defined by its frequency, the Musical Instruments Tuner records the sound of the instrument, analyzes the waveform of the sound to detect its frequency, and then compares the frequency with the standard frequency definition for each music note, so that it can detect the music note and the deviation. The Musical Instruments Tuner has 3 main features: Display the recorded sound’s waveform, display the analyzed frequency spectrum and detect the music note and the deviation. Each feature can be turned on or off independently. modTuner is a sophisticated automatic chromatic tuner suitable for tuning a wide range of musical instruments including guitars, basses, ukuleles, violins, violas and cellos. Its large, easy to read display is ideal for tuning even at a distance, and the carefully designed white-on-black appearance is ideal for use in dark performance environments. modTuner uses a sophisticated digital signal processing algorithm to accurately and reliably detect the fundamental frequency of the note being played. modTuner’s background graphic glows when a reliable tone is detected, providing you with greater confidence while tuning. 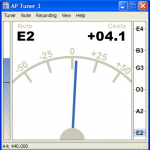 APTuner is built around a best-in-class note detector spanning 8 octaves even for low piano notes. Our analysis algorithm eliminates many of the octave or fifth errors you often see with other tuners. New to version 1.2 is our true 8 octave strobe display. Every audio sample is fed through the GPU to calculate the real stroboscopic effect–exactly like a mechanical spinning disk. Transpose concert pitch to your instrument. Switch to a wide range of historical temperaments.